District Attorney George Gascón spoke to the media on the arrest of alleged murderer Lisa Gonzales on June 2. Photo by Abraham Rodriguez. 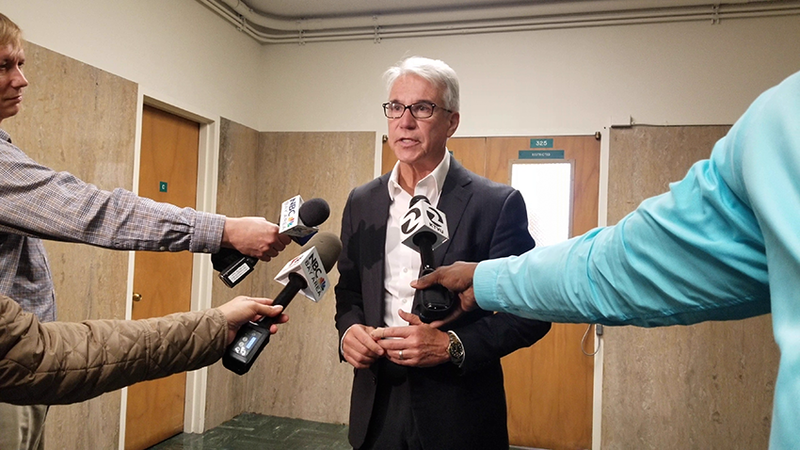 District Attorney George Gascón abruptly announced Tuesday afternoon that he would not be seeking a third term. In an email sent shortly before 4 p.m. by his campaign consultant Dan Newman, Gascon stated that he will serve out the rest of his term before stepping away from civic life to care for his elderly mother. Gascón stated in the email that he does not see how he can maintain his family life, care for his 90-year-old mother and still effectively work as the city’s District Attorney — while also running a full-time campaign to keep his job. “I am her only child and have the responsibility to be there for her. It became clear that launching a re-election campaign would not be compatible with taking care of her adequately in this moment of need. As her son, I must meet that obligation. There is no acceptable alternative.” the email stated (it is posted at the end of this article in full). Gascón was facing what was, by all accounts, stiff competition from former police commissioner Suzy Loftus, a Kamala Harris lieutenant in both the DA’s and Attorney General’s office; former police commissioner Joe Alioto Veronese; and deputy state AG Leif Dautch. Loftus will, all but certainly, run with the strong backing of both Harris and Mayor London Breed. Calls to all three challengers have not been returned as of press time. The DA still has 14-odd months to finish out his third term. Today marks an unconventional moment in what has been an unconventional tenure. At the time of his appointment by Newsom, Gascón had not tried a single case. He earned his J.D. when he was in his early 40s while attending Western State in Fullerton — then an unaccredited school — in his spare time while serving as a Los Angeles Police Department officer. And yet, none of the above has defined Gascón’s public persona. On the right, he was criticized for his office getting schooled by none other than Gonzalez, who won a massive acquittal for Jose Ines Garcia Zarate, the undocumented immigrant who shot Kathryn Steinle on Pier 14. On the left, vituperative protesters, incensed that the DA has not filed charges against police officers who have shot and killed unarmed citizens, have protested Gascón at his home, his office, and any public appearance in which his presence was announced. Our calls and messages today to some of the DA’s fiercest critics have not yet been returned. Father Richard Smith, a more measured critic, said Gascon’s reason for giving up his spot was a valid one — but Smith himself would have left the post for a different reason: “For me, it would have been that the system is so corrupt and so rigged that you become complicit in covering up crimes,” he said, referring to Gascón’s declining repeatedly to charge officers involved in fatal shootings of civilians. Smith said that Gascón has been “heroic” in other ways: he supported Prop 47, which made certain nonviolent crimes misdemeanors, and he supported a bill that would have largely made it easier for prosecutors to charge police officers involved in fatal shootings. November 2019 is a ways off, and Ross says more challengers may emerge. “You would have to imagine [Loftus] would be the most vulnerable from the left,” he said. And who from the left could possibly pose a formidable challenge to Loftus? “Matt Gonzalez,” Ross said — emphasizing that he has no knowledge of whether Gonzalez plans to run. Gonzalez, in fact, challenged then-District Attorney Terrence Hallinan in 1999 when Gonzalez was an up-and-comer in the Public Defender’s office. But he failed to make the runoff. He went on to be elected District 5 supervisor, lose to Newsom in the 2003 mayor’s race, and run as Ralph Nader’s vice-presidential candidate in the 2008 campaign. Messages left for Gonzalez today were not immediately returned. Jane Kim and David Campos have also been bandied about as early potential left-leaning contenders, and neither has yet ruled out the possibility. The past eight years as your District Attorney have been some of the most professionally rewarding years of my life. You trusted me to lead our work on criminal justice reform and public safety, and I have been humbled to serve you. We have accomplished so much together. I was fortunate to assume the office after Senator Kamala Harris. Her smart on crime approach resonated with me and mirrored my reasons for accepting the role. I have worked hard to bring meaningful improvements and reforms to the office. With your help, we cut the homicide rate in half. Violent crime is down across the city and we have made needed progress to reduce property crime. With the help of the men and women in my office, we created the Crime Strategies Unit – a unit focused on stopping the most prolific criminals using crime analysis tools and data, and the Independent Investigations Bureau – created to help investigate and prosecute illegal use of force by law enforcement. In addition to these important crime fighting efforts, we created the nation’s first Young Adult Court focused on helping eighteen to twenty-five-year-old offenders turn their lives around. Against the tide of nearly all prosecutors around the state, we also took the lead in proactively dismissing old marijuana convictions. This leadership encouraged many DAs to join our effort and resulted in state legislation that will help people erase their old convictions which will allow them to find employment and housing and improve their own lives and their community. The job of District Attorney is an enormous responsibility. It requires doing the right thing, even when it is unpopular, perhaps especially when it is unpopular. To do it well requires a serious commitment of time and energy. I have been able to do that because of the support of my family. The women in my life have made countless sacrifices for my career. My amazing wife Fabiola, whose energy and support inspires my every move; my daughters – the pride of my life; and my mother, a true warrior who nourished my development and growth in every conceivable way, are the most important people in my world. I recognize that without these strong women in my life, and my late father, who gave up so much for me, I would not be a fraction of the man I am today. Every achievement, every accomplishment, I owe to their unwavering love and support. I have asked so much of them over the years. After two successful elections, I began preparation for a third full term. Knowing full well what is involved in running a winning campaign, my mother’s weakened health weighed heavily on my mind. She is ninety years old and has much greater needs than when I took office. I am her only child and have the responsibility to be there for her. It became clear that launching a re-election campaign would not be compatible with taking care of her adequately in this moment of need. As her son, I must meet that obligation. There is no acceptable alternative. At this time, I simply cannot be the son I want to be and seek a third term. My career means a great deal to me. But success in the world with a family in chaos is not a choice I am willing to make. It is difficult to step away, especially when we are experiencing so much success and progress. I am flattered by the robust and diverse support for my campaign and it will be hard to walk away from that. But, at this time in my life, it is the only choice I am certain I can live with. I will fulfill the last year of my term and then allow the voters to choose my successor. I am honored to be your District Attorney. I look forward to completing my term and to a continued role in public service. I hope and expect whoever is the next District Attorney of San Francisco will continue these efforts and carry forward the legacy of the great work done in this office. Whoever it is will have my full support in the transition. Thank you for your continued support as my family and I navigate this next phase. If the familial obligations are so pressing, why wait until January, 2020, to leave office? As he stated above, the time constraint he is having involves not having time to launch a reelection campaign on top of his family and job responsibilities. This article is not so subtle with its hinted endorsement of Matt Gonzalez. But that’s nothing close to a done deal. In fact, the city has changed a lot over the past ten years, and the old-guard progressive cabal doesn’t hold the same sway over voters that they used to. Matt Gonzalez as DA would be like letting the fox guard the henhouse! Modern SF residents want a DA who will take a stronger stance against the criminals who are running rampant in SF, breaking into cars and stealing bikes, doing hard drugs out in the open on city streets and harassing people just trying to pass by, etc. We want someone who will prosecute murderers and rapists without protecting thet because of their immigration status. We know that Gonzalez would be super-soft on crime, which is not what this city needs right now. Mission Local may think that folks like Equipto are local heroes, but many San Franciscans see him as a supporter of law-breakers, as someone who wants to allow criminals free reign over the city. Gascon has been a good DA, finding a necessary balance between progressive and still supporting enforcement of the law. Gonzalez should stick to life in the private sector. There’s no “endorsement” of Gonzalez. He was a potential candidate brought up by an independent campaign consultant speaking to one of three reporters writing a deadline story. Your comment that this publication considers Equipto a hero indicates a lack of reading of our coverage, or comprenending it. Your comments about prosecuting “murderers and rapists without protecting thet (sic) because of their immigration status” reveals more than any analysis of or rebuttal to your commentary. Franke Katz: Gonzalez isn’t in the private sector- he’s been Chief Attorney for the SF Public Defender’s Office since 2011, upholding the consitution and helping those who can’t afford a good defense. Run, Matt, Run! Ok so the DA decided not to run for office again. A few months later he is purported to be investigated by the TSA. Coincidence or Elvis.